Acquired mitral stenosis (MS), or mitral valve stenosis, is virtually synonymous with rheumatic heart disease. In genetically susceptible individuals, rheumatic fever occurs as a complication of group A streptococcal infection. Other rare causes of acquired MS include carcinoid causes, systemic lupus erythematosus, rheumatoid arthritis, and some mucopolysaccharidoses. The underlying pathological process is a diffuse inflammation of connective tissue. Not all group A streptococcal infections lead to rheumatic fever. Studies demonstrate that rheumatic fever follows infection of the upper respiratory tract and rarely, if ever, follows skin infection. Similarly, not all cases of streptococcal pharyngitis lead to rheumatic fever. In fact, only 2-3% of patients with untreated group A streptococcal pharyngitis develop this complication. Appropriate treatment of streptococcal pharyngitis prevents rheumatic fever. Rheumatic heart disease primarily affects the mitral valve; mitral regurgitation (MR), or mitral valve regurgitation, is the initial hemodynamic consequence. Lesions of the mitral valve begin as deposits of fibrin and RBCs that form small verrucae along the borders of the mitral valve leaflets. When the inflammation subsides, the verrucae are replaced by fibrous tissue. Over at least several years, the individual may then develop fibrosis of the mitral ring; contracture of the mitral leaflets, chordae tendineae, and papillary muscles; and commisural adhesions that result in valve stenosis. Therefore, rheumatic heart disease is a lifelong and sometimes progressive disease. Mitral valve stenosis results from a pathologic process that narrows the effective mitral valve orifice. Proper function of the mitral valve requires an intact mitral valve apparatus and satisfactory left ventricle (LV) function. The mitral valve is the inlet valve to the LV. The normal mitral valve is a complex apparatus composed of an annulus and two leaflets that are attached to two papillary muscles by chordae tendineae. The papillary muscles arise from the walls of the LV and secure the chordae and mitral leaflets, preventing prolapse of the valve during ventricular systole. Mitral valve stenosis, such as is seen in rheumatic fever, occurs because of fibrous scarring of the valve leaflets with subsequent calcification, thereby decreasing the size of the effective valve orifice. Subvalvular and supravalvular MS are congenital anomalies (see Mitral Stenosis, Congenital). The normal adult mitral valve orifice cross-sectional area is 4-6 cm2. When reduced to 2 cm2, hemodynamically significant MS occurs. At 1 cm2, obstruction to blood flow into the LV becomes critical because a left atrial mean pressure of 25 mm Hg is necessary to maintain normal cardiac output. Elevated left atrial pressure is transmitted to the pulmonary veins and pulmonary capillaries. Congested bronchial veins encroach on small bronchioles and cause subsequent increase in airway resistance. In addition, elevated hydrostatic pressure in the capillaries forces fluid into the alveoli and interstitial space, producing pulmonary congestion. As a compensating mechanism, pulmonary vasoconstriction develops, causing pulmonary hypertension. At this stage, the right ventricle (RV) faces an increased afterload, leading to RV hypertrophy. Over time, fixed pulmonary arterial hypertension may develop from medial hypertrophy and intimal thickening of the pulmonary arterioles. RV myocardial dysfunction may develop, resulting in tricuspid valve regurgitation. Severe MS results in decreased cardiac output. If reduction in cardiac output is critical, end organ failure with shock, metabolic acidosis, and renal and/or hepatic insufficiency can occur. In addition, RV failure provokes systemic venous congestion with development of hepatomegaly, ascites, and pedal edema. Hemodynamic changes in severe mitral valve stenosis (MS). MS causes an obstruction (in diastole) to blood flow from the left atrium (LA) to the left ventricle (LV). Increased LA pressures are transmitted retrograde to pulmonary veins and pulmonary capillaries, resulting in capillary leak with subsequent development of pulmonary edema. 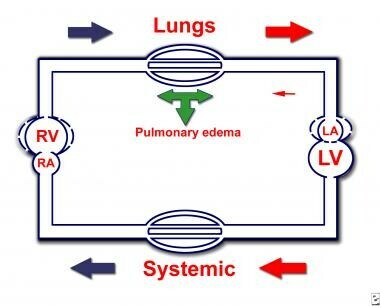 To overcome pulmonary edema, the arterioles constrict, increasing pulmonary pressures. Over time, capillaries develop intimal thickening, causing fixed (permanent) pulmonary hypertension. The right ventricle (RV) hypertrophies to generate enough pressure to overcome the increased afterload. Eventually, the RV fails, which manifests as hepatomegaly and/or ascites, edema of the extremities, and cardiomegaly on radiography. Patients may remain asymptomatic for many years as long as the MS is mild and not accompanied by more than mild MR. These patients, of course, are susceptible to further damage to the mitral valve with repeated group A streptococcal pharyngitis. For this reason, ongoing antibiotic prophylaxis is recommended. By the second or third decade of life, calcium deposits further constrict the effective mitral orifice of the already damaged mitral valve. Once the effective valvular orifice decreases significantly, symptoms occur. In developing countries, rheumatic MS manifests 10-30 years after the initial rheumatic insult to the mitral valve. In developed countries, this latent period may be as long as 50 years. Untreated acquired MS due to rheumatic heart disease follows a slowly progressive course, with the patient remaining asymptomatic for years before dyspnea or sudden deterioration from atrial fibrillation ensues. The overall 10-year survival rate of untreated patients who have acquired MS is 50-60%, but the 10-year survival rate reaches 80% if the patient is asymptomatic. Once symptoms develop, prognosis worsens significantly. If the patient presents with dyspnea, the 1-year survival rate is less than 15%. After percutaneous balloon valvotomy or surgical commissurotomy, the 5- to 7-year survival rate is 50-90%. After surgical commissurotomy, the reoperation rate is 5-7% and the 5-year complication-free survival rate 80-90%. Mitral valve replacement entails a 5% mortality risk in young, healthy patients. If symptoms are absent or minimal, the overall 10-year survival rate of untreated patients with MS is 80%. Once symptoms develop, the mortality risk and disease progression increase substantially. In an unselected group of patients with MS of varying severity, 60% were alive after 10 years. If congestive heart failure (CHF) develops, the prognosis is grim, with a 10-year survival rate of 15%. Diuretics may provoke dehydration (decreased preload) with subsequent compromise in cardiac output. Because of electrolyte derangements, these drugs may also predispose patients to arrhythmias when administered with digoxin or class I or III antiarrhythmics. Antiarrhythmic medications or electrolyte derangements precipitate fatal arrhythmias. Warfarin may cause hemorrhagic complications. Mitral commissurotomy may cause significant MR that may necessitate mitral valve replacement. Complications of mitral valve replacement include valve thrombosis, valve dehiscence, infective endocarditis, valve malfunction, embolic events, and anticoagulation-related complications. Percutaneous balloon valvuloplasty may result in significant MR (especially if the mitral valve is already calcified). Approximately 3% of patients require mitral valve replacement after balloon valvuloplasty. Fatality occurs in 1-2% of patients. Perforation of the ventricle occurs in 0.5-4%. Embolic events occur in 1-3%. Myocardial infarction occurs in 0.3-0.5% of patients. Genetic predisposition plays a significant role in occurrence of rheumatic fever after group A streptococcal infection. Family studies suggest that susceptibility to the disease involves a single recessive gene. Rheumatic fever equally affects both sexes. However, in those who acquire rheumatic heart disease, MS is more common in women. Reasons for this are unknown. Rheumatic fever is a disease of childhood, its incidence parallels that of streptococcal pharyngitis. MS usually arises in persons older than 15-20 years because the disease progresses to that stage over many years. This time interval is significantly shorter in developing countries. Acquired MS is exceedingly rare in the pediatric population in the United States. Acquired MS secondary to rheumatic fever remains the most common form of MS that occurs in adulthood. Current estimates indicate that the prevalence of rheumatic fever in the United States is less than 1 case per 100,000 people. A steady decline has been observed in the incidence of rheumatic fever and, thus, in acquired MS. In some developing countries, such as India, the prevalence of rheumatic fever is 100-150 cases per 100,000 people. Following development of rheumatic heart disease, evidence of MS may develop as early as the teenage years, presumably because of a more aggressive initial attack and/or recurrent bouts of rheumatic fever (consequences of suboptimal or absent antibiotic prophylaxis). In some developing countries, the prevalence of rheumatic heart disease in children is 5-15 cases per 1000 people. Shah B, Sharma M, Kumar R, Brahmadathan KN, Abraham VJ, Tandon R. Rheumatic Heart Disease: Progress and Challenges in India. Indian J Pediatr. 2012 Sep 2. [Medline]. Roberts-Thomson KC, Stevenson IH, Kistler PM, Haqqani HM, Goldblatt JC, Sanders P, et al. Anatomically determined functional conduction delay in the posterior left atrium relationship to structural heart disease. J Am Coll Cardiol. 2008 Feb 26. 51(8):856-62. [Medline]. Selcuk MT, Selcuk H, Maden O, Temizhan A, Aksu T, Dogan M, et al. Relationship between inflammation and atrial fibrillation in patients with isolated rheumatic mitral stenosis. J Heart Valve Dis. 2007 Sep. 16(5):468-74. [Medline]. Ucer E, Gungor B, Erdinler IC, Akyol A, Alper AT, Eksik A, et al. High sensitivity CRP levels predict atrial tachyarrhythmias in rheumatic mitral stenosis. Ann Noninvasive Electrocardiol. 2008 Jan. 13(1):31-8. [Medline]. Movahed MR, Ahmadi-Kashani M, Kasravi B, Saito Y. Increased prevalence of mitral stenosis in women. J Am Soc Echocardiogr. 2006 Jul. 19(7):911-3. [Medline]. Ahmed S, Ayoub EM, Scornik JC, et al. Poststreptococcal reactive arthritis: clinical characteristics and association with HLA-DR alleles. Arthritis Rheum. 1998 Jun. 41(6):1096-102. [Medline]. Gouya H, Cabanes L, Mouthon L, Pavie A, Legmann P, Vignaux O. Severe mitral stenosis as the first manifestation of systemic lupus erythematosus in a 20-year-old woman: the value of magnetic resonance imaging in the diagnosis of Libman-Sacks endocarditis. Int J Cardiovasc Imaging. 2014 Apr 9. [Medline]. Kennedy JL, Mery CM, Kern JA, Bergin JD. Mitral stenosis caused by an amplatzer occluder device used to treat a paravalvular leak. Ann Thorac Surg. 2012 Jun. 93(6):2058-60. [Medline]. Horstkotte D, Fassbender D, Piper C. [Congenital heart disease and acquired valvular lesions in pregnancy]. Herz. 2003 May. 28(3):227-39. [Medline]. Yuce M, Davutoglu V, Ozbala B, Ercan S, Kizilkan N, Akcay M, et al. Fragmented QRS is predictive of myocardial dysfunction, pulmonary hypertension and severity in mitral stenosis. Tohoku J Exp Med. 2010. 220(4):279-83. [Medline]. Ozdemir O, Alyan O, Soylu M, et al. Relation between Sympathetic Overactivity and Left Atrial Spontaneous Echo Contrast in Patients with Mitral Stenosis and Sinus Rhythm. Heart Lung Circ. 2006 Jul 20. [Medline]. Morris MF, Maleszewski JJ, Suri RM, Burkhart HM, Foley TA, Bonnichsen CR, et al. CT and MR imaging of the mitral valve: radiologic-pathologic correlation. Radiographics. 2010 Oct. 30(6):1603-20. [Medline]. Messika-Zeitoun D, Serfaty JM, Laissy JP, et al. Assessment of the mitral valve area in patients with mitral stenosis by multislice computed tomography. J Am Coll Cardiol. 2006 Jul 18. 48(2):411-3. [Medline]. Wu M, Zhang S, Dong A, He Z, Chen S, Chen R. Long-term outcomes of maze procedure plus valve replacement in treating rheumatic valve disease resulting in atrial fibrillation. Ann Thorac Surg. 2010 Jun. 89(6):1942-9. [Medline]. Bonow RO, Carabello BA, Chatterjee K, de Leon AC Jr, Faxon DP, Freed MD, et al. 2008 Focused update incorporated into the ACC/AHA 2006 guidelines for the management of patients with valvular heart disease: a report of the American College of Cardiology/American Heart Association Task Force on Practice Guidelines (Writing Committee to Revise the 1998 Guidelines for the Management of Patients With Valvular Heart Disease): endorsed by the Society of Cardiovascular Anesthesiologists, Society for Cardiovascular Angiography and Interventions, and Society of Thoracic Surgeons. Circulation. 2008 Oct 7. 118(15):e523-661. [Medline]. Antonini-Canterin F, Moura LM, Enache R, Leiballi E, Pavan D, Piazza R, et al. Effect of hydroxymethylglutaryl coenzyme-a reductase inhibitors on the long-term progression of rheumatic mitral valve disease. Circulation. 2010 May 18. 121(19):2130-6. [Medline]. Antonini-Canterin F, Leiballi E, Enache R, Popescu BA, Rosca M, Cervesato E, et al. Hydroxymethylglutaryl coenzyme-a reductase inhibitors delay the progression of rheumatic aortic valve stenosis a long-term echocardiographic study. J Am Coll Cardiol. 2009 May 19. 53(20):1874-9. [Medline]. Geldenhuys A, Koshy JJ, Human PA, Mtwale JF, Brink JG, Zilla P. Rheumatic mitral repair versus replacement in a threshold country: the impact of commissural fusion. J Heart Valve Dis. 2012 Jul. 21(4):424-32. [Medline]. Bernal JM, Ponton A, Diaz B, et al. Combined mitral and tricuspid valve repair in rheumatic valve disease: fewer reoperations with prosthetic ring annuloplasty. Circulation. 2010 May 4. 121(17):1934-40. [Medline]. Cho IJ, Hong GR, Lee S, Byung-Chul C, Ha JW, Chung N. Predictors of prognosis in patients with mild to moderate paravalvular leakage after mitral valve replacement. J Card Surg. 2014 Mar. 29(2):149-54. [Medline]. Acar J, Michel PL, de Gevigney G. [When is surgery needed for minimally symptomatic or asymptomatic acquired valvulopathy?]. Presse Med. 2000 Nov 13. 29(34):1867-75. [Medline]. Ananthasubramaniam K, Iyer G, Karthikeyan V. Giant left atrium secondary to tight mitral stenosis leading to acquired Lutembacher syndrome: a case report with emphasis on role of echocardiography in assessment of Lutembacher syndrome. J Am Soc Echocardiogr. 2001 Oct. 14(10):1033-5. [Medline]. Boudoulas H, Vavuranakis M, Wooley CF. Valvular heart disease: the influence of changing etiology on nosology. J Heart Valve Dis. 1994 Sep. 3(5):516-26. [Medline]. Bruce CJ, Nishimura RA. Clinical assessment and management of mitral stenosis. Cardiol Clin. 1998 Aug. 16(3):375-403. [Medline]. Bruce CJ, Nishimura RA. Newer advances in the diagnosis and treatment of mitral stenosis. Curr Probl Cardiol. 1998 Mar. 23(3):125-92. [Medline]. Cheng TO. Percutaneous versus surgical treatment of atrial septal defect and of mitral stenosis: Cost-effectiveness in developing versus developed countries. Int J Cardiol. 2006 Jul 5. [Medline]. Denbow CE, Barton EN, Smikle MF. The prophylaxis of acute rheumatic fever in a pair of monozygotic twins. The public health implications. West Indian Med J. 1999 Dec. 48(4):242-3. [Medline]. Keat A. Reactive arthritis. Adv Exp Med Biol. 1999. 455:201-6. [Medline]. Mackie SL, Keat A. Poststreptococcal reactive arthritis: what is it and how do we know?. Rheumatology (Oxford). 2004 Aug. 43(8):949-54. [Medline]. Oechslin E, Turina J, Lauper U, et al. [Cardiovascular disease in pregnancy]. Ther Umsch. 1999 Oct. 56(10):551-60. [Medline]. Ozen S, Bakkaloglu A, Yilmaz E, et al. Mutations in the gene for familial Mediterranean fever: do they predispose to inflammation?. J Rheumatol. 2003 Sep. 30(9):2014-8. [Medline]. Shulman ST, Ayoub EM. Poststreptococcal reactive arthritis. Curr Opin Rheumatol. 2002 Sep. 14(5):562-5. [Medline]. Sokoloski MC. Tachyarrhythmias Confined to the Atrium. Clinical Pediatric Arrhythmias. 1999. 78-96. Villablanca AC. Heart disease during pregnancy. Which cardiovascular changes reflect disease?. Postgrad Med. 1998 Nov. 104(5):149-56. [Medline].